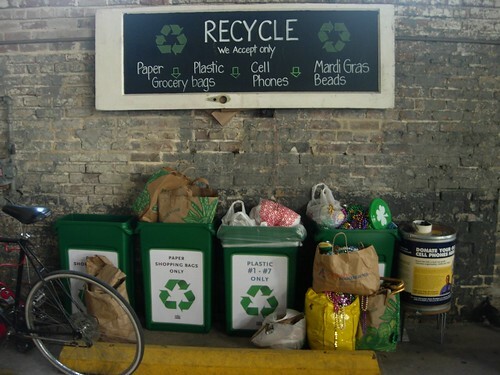 Watching Treme on HBO and feeling slightly melancholy. Lots of scenes in Candlelight Lounge. 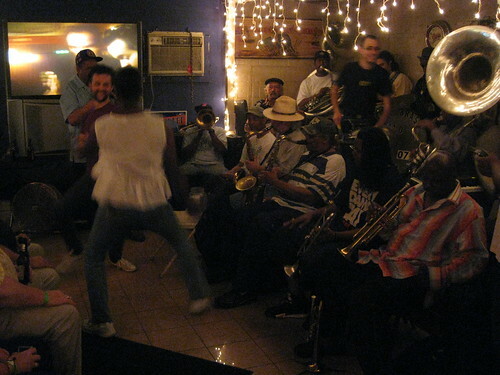 We went on Wednesdays when Treme Brass Band plays. Miller light. Only good times. 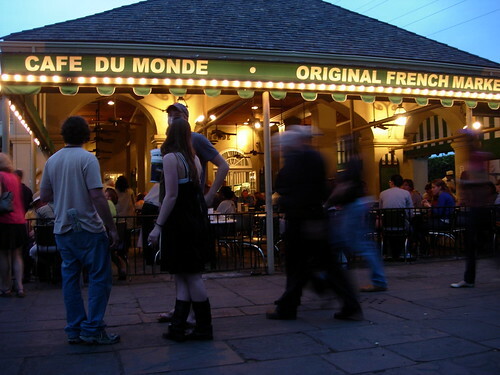 New Orleans, you are so much more than your food, and I will miss you. New Orleans breakfast no. 3 at Cake Cafe. No line outside, but a recommendation from a trusty source. 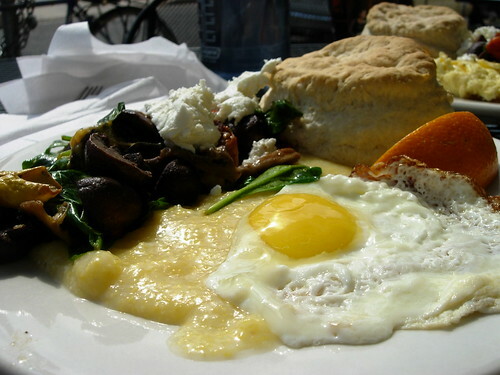 Grits with grilled veggies and coat cheese, fried egg, biscuit. We also sampled their moist cupcakes and employed a newly acquired technique. 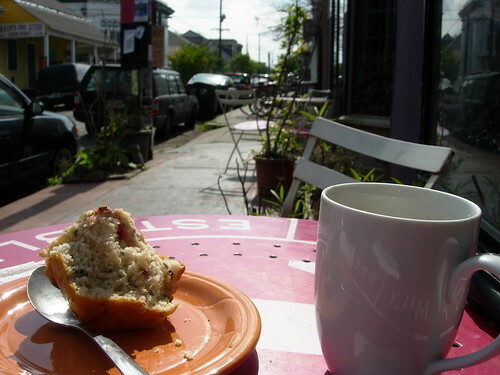 The amount of cafes in New Orleans overwhelmed me. I didn’t even try to find my one coffeeshop to work from. I just worked from any old cafe, knowing that I would never have enough time in a month to find my favorite. 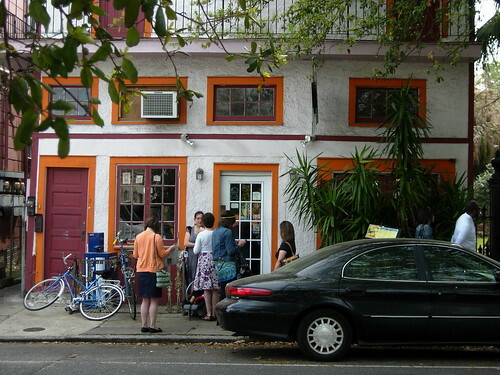 However, Sara found Satsuma cafe, which I didn’t visit until my last day. 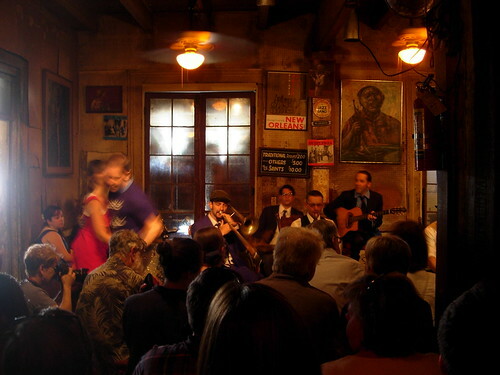 Had I found it earlier, Satsuma, in the Bywater, would’ve been the one. Double americano and strawberry basil muffin. I had found my favorite drinking establishment of the road, now I know my favorite eating establishment. Pete’s Pizza Speakeasy. Except that’s not the name of the restaurant because there is no restaurant. 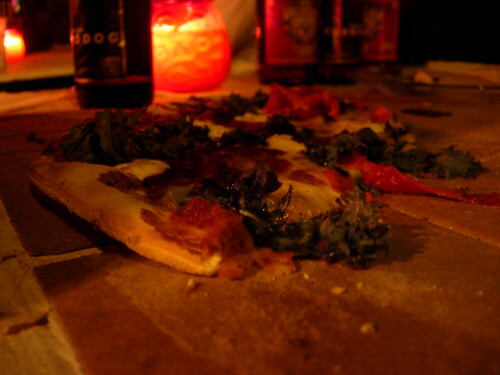 It’s a guy who became obsessed with building a pizza oven in his back yard, did it, and now with a friend makes as many pizzas as he can on Thursday nights in New Orleans. Some friends and I went yesterday, and it was such a deliciously good time. We got cream cheese stuffed smoked jalepeños (they smoke veggies and meat in their oven during the day as it warms up) and some delicious pizzas (1: traditional crust, marinara sauce, kale, goat cheese, red peppers; 2: muy picante crust, olive oil and garlic, artichoke hearts, fresh oregano,). Call 504-383-HEAT for info. OK , this guy pays his bills by throwing a pizza party once a week. AND there are two competing Pizza speakeasy joints in New Orleans (I just found out about Pizza Delicious, but they only do pickup (“you’ll know where when you call”). Who doesn’t want to move here!? 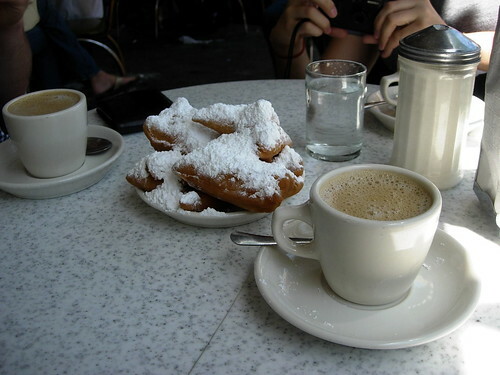 Chicory coffee, beignets covered in so much powdered sugar I nearly choked. Better than your average fried dough. 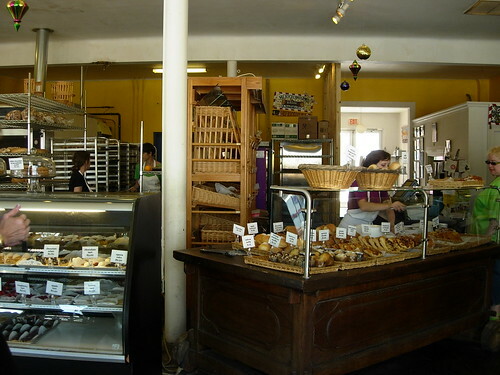 breakfast at La Boulangerie: croissants! coffee! Next breakfast- Slim Goodies. 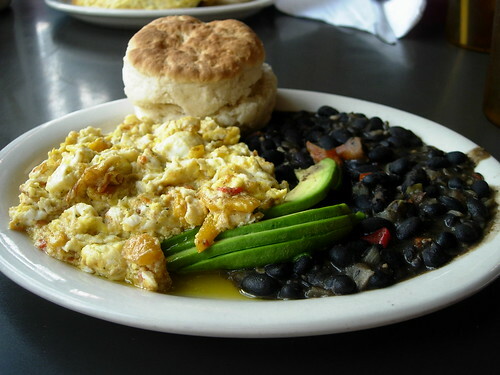 At Slim’s I had scrambled eggs (a rare choice for me) with pesto veggies and goat cheese, black beans, avocado and a biscuit. The menu is outrageously large. I could order something different every Saturday for a year, however, I will never ever order a pancake with an egg inside. 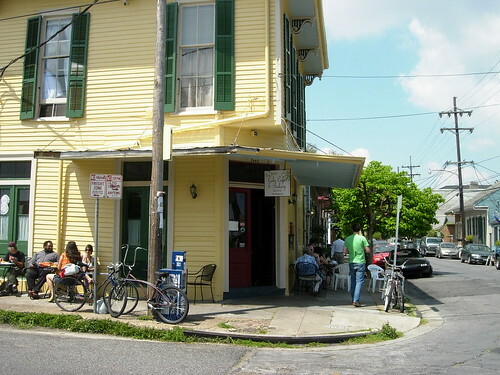 Where does one even begin for breakfast in New Orleans? I started where the lines were. First up, Surrey’s Juice Bar. 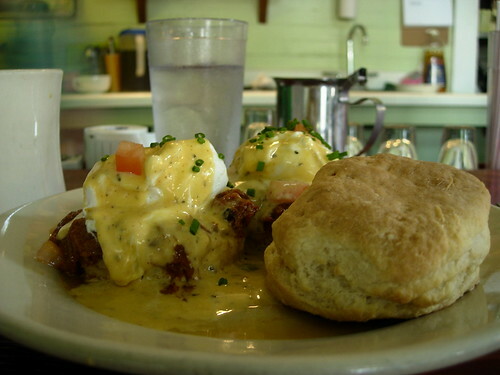 poached eggs and pulled pork on jalapeño grit cakes covered in Cajun hollandaise sauce. I could only eat one. My coworkers and I do a pretty good job of remembering that we’re not at home, but we’re also not on vacation. In more ways than one, we can’t afford to eat out for lunch too often. Most days we bring empty yogurt quarts full of healthy goodies, but sometimes we work dangerously near delicious (if overpriced) food. Also…sandwiches are one of my weaknesses. 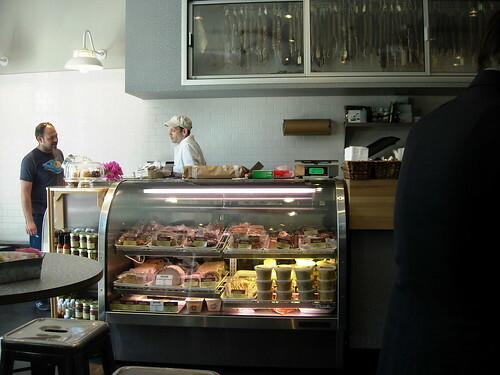 Collectively, we have tried all the sandwiches at Butcher (little brother to next door’s famous Cochon) except perhaps their version of a Bahn Mi, which I just can’t justify paying 10 bucks for. I recently had the pork belly sandwich with mint and cucumber. I also sampled their bacon praline which tasted like sweet lard. 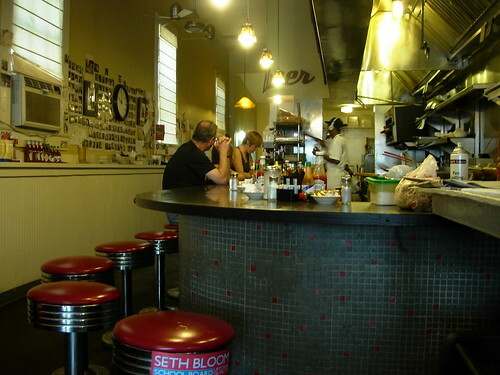 It’s hip and shiny in there, they have bottles of Barq’s root beer, and stacked wood for smokin’.